Good morning! I hope you’re having a good week so far. 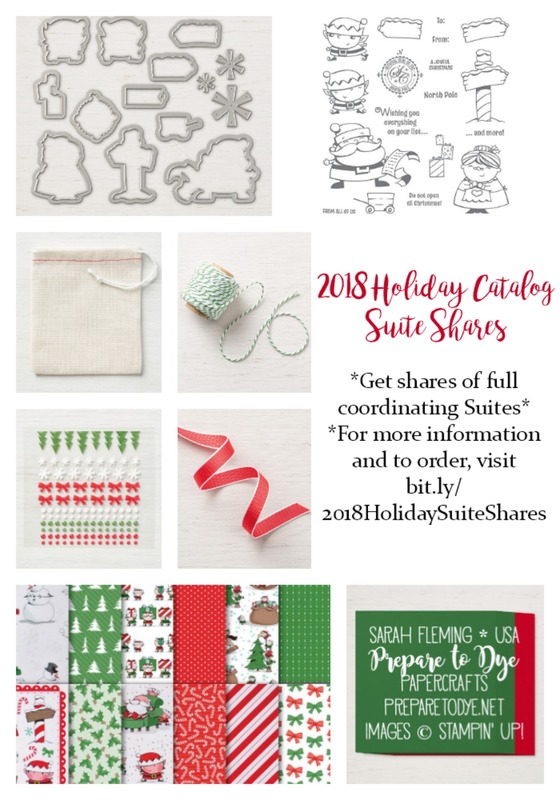 I’m excited to show you a sneak peek project today using the Snowflake Showcase limited-time products. These items are available to demonstrators now (you can add them to a $99 Starter Kit right now!) and will be available to customers for the month of November, while supplies last. Judging from the demonstrator pre-order, these things will be hugely popular. 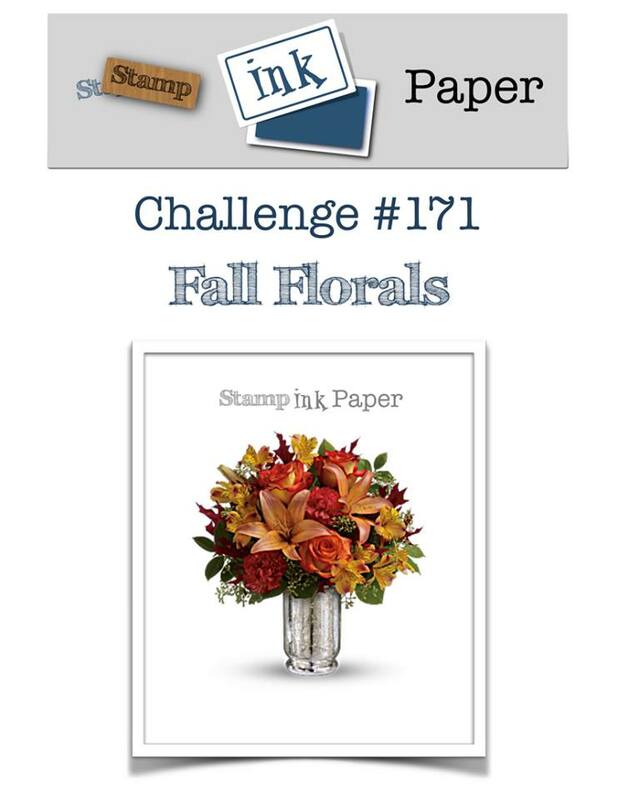 This week’s Stamp, Ink, Paper challenge is a “Fall Florals” theme challenge. We’d love for you to play along this week! This is one of those over-the-top cards that uses a lot of supplies, but I just couldn’t help myself once I got going. You can easily simplify this by using fewer colors of cardstock and ink or leaving off some of the embellisments. 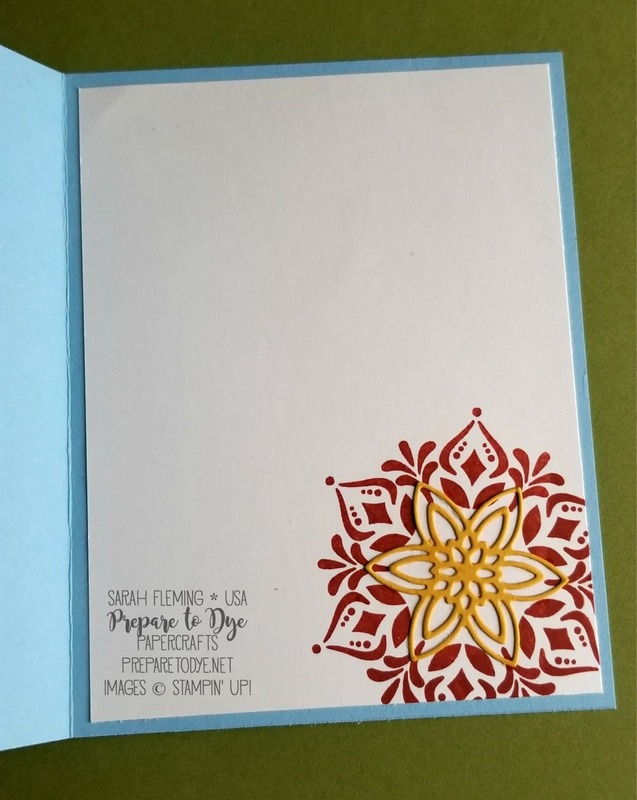 My card starts with a Balmy Blue card base, 4-1/4″ x 11″, scored at 5-1/2″. Next I have a piece of watercolor paper, 4″ x 5-1/4″. 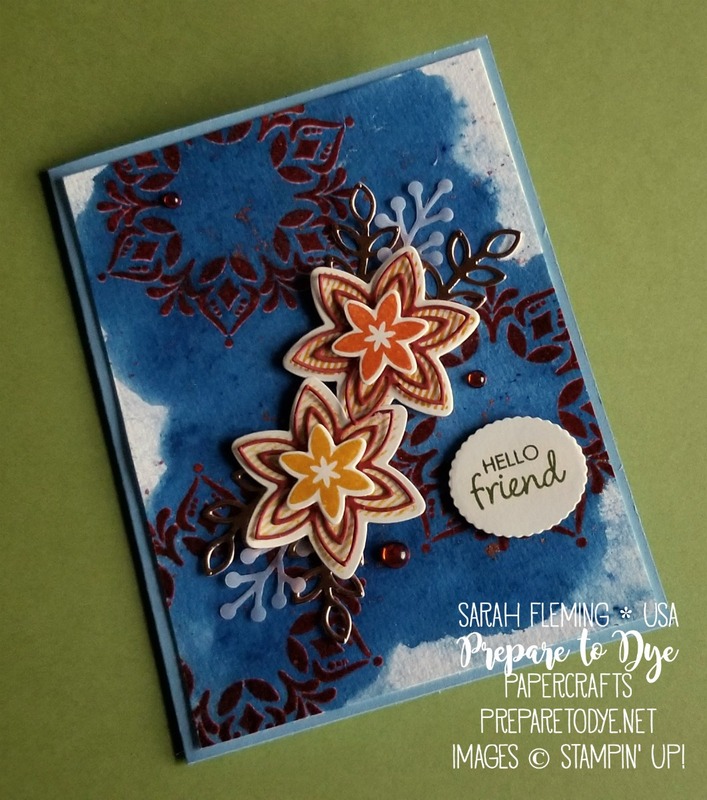 I first stamped the three wreathy things in Cajun Craze, then overstamped each of those with Versamark. The Stamparatus makes this so easy. 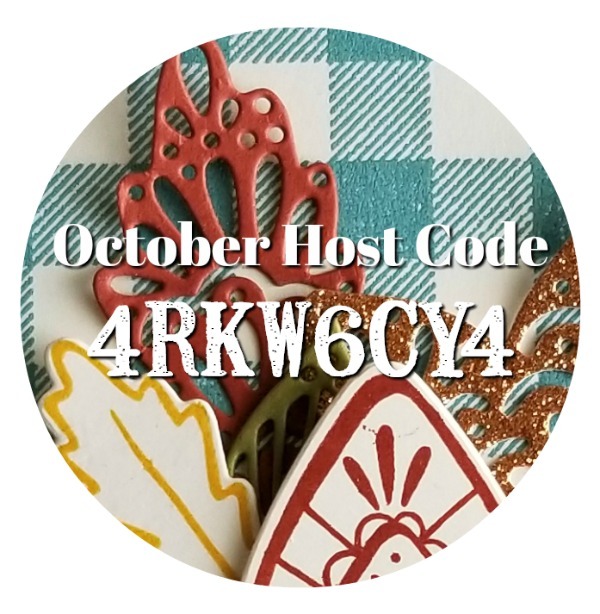 I heat embossed the wreaths with Clear embossing powder. Then I wet down the area I wanted to watercolor and sprinkled on Prussian Blue Brusho. After the Brusho crystals activated, I used my Aqua Painter to blend and smooth the color. Then, after I was sure I’d ruined my background because the Brusho was too dark, I dabbed quite a lot of color up with a baby wipe. After I was happy with the background, I put the background inside an empty Paper Pumpkin box and dipped my Aqua Painter in Bright Copper Shimmer Paint, then tapped the water brush on the edge of the box several times to splatter the paint onto the background. I stamped the flowers in Crushed Curry and Pumpkin Pie and cut them with the stunning Snowfall thinlits dies. I cut a few other pieces out of Cajun Craze cardstock, Vellum, and Copper Foil. I added these with glue and Dimensionals, then stamped the sentiment in Old Olive. I cut the sentiment out using a die from the Alpine Sports thinlits. 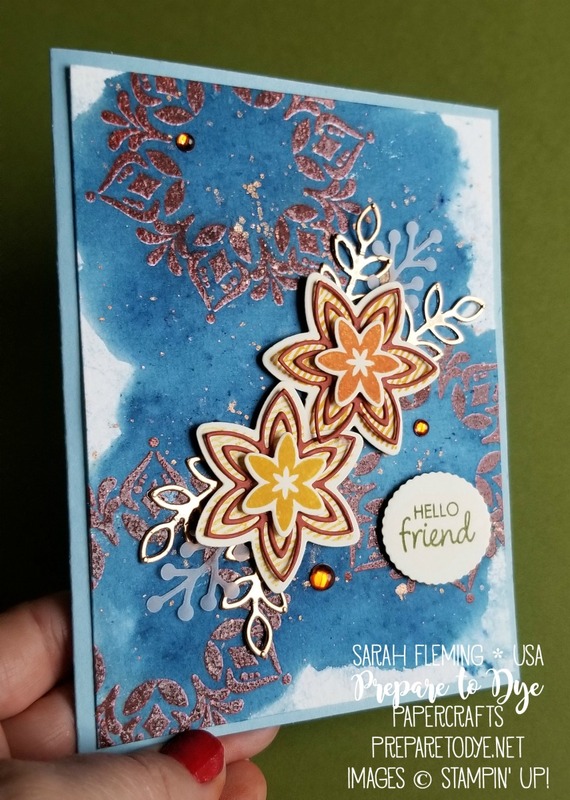 I finished off the card with some Clear Epoxy Droplets colored with the Dark Cajun Craze Blends marker. Inside I stamped the wreath again in Cajun Craze and added a die cut flower to the center.